Learn how today’s advances can help you safeguard your vision and control eye disease. It can be a frightening moment. When the doctor diagnoses an eye disease such as glaucoma, cataract, or AMD, you immediately worry about losing your sight or becoming seriously vision-impaired. It’s important to know what to do not only when disease strikes, but what to do before and after. You should know the warning signs. You should know how a diagnosis is made. And you should know your best treatment options. The good news is, with the proper treatment decisions, those eye diseases can be addressed and controlled and their potential to compromise your sight can be halted. 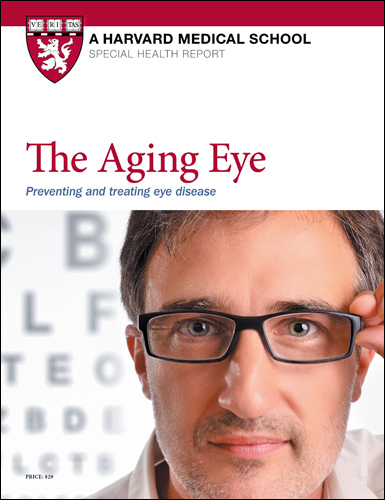 The Aging Eye, a Special Health Report prepared by the doctors at Harvard Medical School, focuses on four disorders that pose the greatest threats to vision after 40: cataract, glaucoma, age-related macular degeneration, and diabetic retinopathy. It will help you determine your risk of developing these disorders, describe their symptoms, and discuss diagnosis. Our eyes do change as we get older. That’s a truth we can do little about. It’s the consequences we can change. Learn all the facts about treating adult eye diseases. Send for your copy of The Aging Eye now!